The traditional Spencer sink vanity is a wonderful addition for those seeking to furnish their bathroom with an elegant, yet non-intrusive piece. 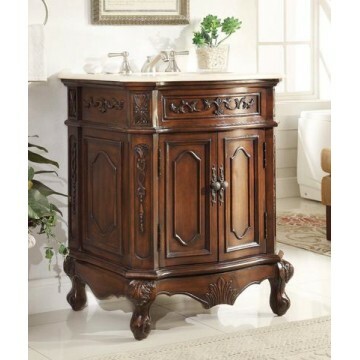 Crafted with refined edges and intricate, hand-carved flourishing, the Spencer sink vanity is both stunning and durable. This vanity features a polished white marble counte top that serves as a stunning contrast to the lush wood finish. The Spencer sink vanity is sure to transform any compact bathroom into a space of luxury. The white marble countertop is made of the highest quality to be durable and long-lasting, and to resist the effects of prolonged exposure to humid conditions.